With Rural Rising! as its theme, this year’s Utah Rural Summit features keynote addresses from internationally acclaimed community branding expert Roger Brooks, Utah Governor Gary Herbert, and NBA New York Knicks head coach and Utah Jazz All-Star Jeff Hornacek. Other conference presenters include author and rural researcher Ben Winchester, as well as numerous business leaders, state officials, and local leaders. The conference theme, Rural Rising, encompasses both the current economic strength of the rural economy, as well as the emerging competitive advantages that flow from rural lifestyles and innovations. This theme is echoed by keynote speaker, Ben Winchester with University of Minnesota Extension, as he cites research that contradicts many of the prevailing but false myths regarding rural America. “Many assume that the rural story has already been told -- small towns that keep getting smaller, and churches, schools, clinics, businesses that have closed their doors,” says Winchester. “This deficit framework dominates how we discuss and envision our rural communities. The reality, however, is that the story of rural America since 1970 is rich and diverse, with many positive trends occurring. Winchester goes on to explain that rural America has been experiencing a “brain gain” over the past decade, and that entrepreneurial energy in rural places is stronger than ever. Roger Brooks is widely recognized as one of the premier community and destination branding experts in the world. Over the past 30 years Roger has helped thousands of people transform ordinary places, businesses, and attractions into incredibly successful destinations. Brooks has assisted in the development and marketing of acclaimed destination resorts including Whistler Resort in British Columbia; Harbour Town on Hilton Head Island, South Carolina; Sunriver Resort in Central Oregon, and several others. Roger has since worked with nearly a thousand communities, as well as many states, provinces, national parks, and countries in their branding, product development and marketing efforts. The Utah Rural Summit is especially pleased to have Jeff Hornacek as a keynote speaker. Hornacek is the Head Coach of the New York Knicks, one of the NBA’s cornerstone franchises, and is one of the most popular players to ever wear the Jazz uniform in Utah. Hornacek was named head coach of the New York Knicks on June 3, 2016 after serving as head coach of the Phoenix Suns from 2013 – 2016. Prior to coaching, Hornacek enjoyed a 14 year NBA career. 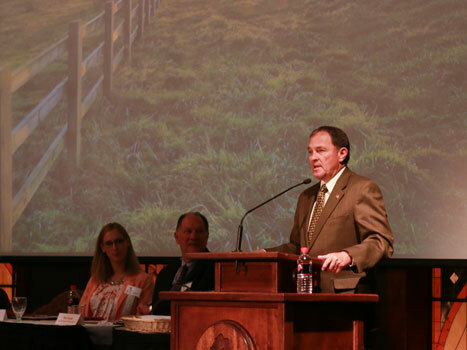 The Utah Rural Summit also features a number of breakout sessions covering a variety of topics, including natural resources, public lands issues, and challenges facing energy development, as well as a special tourism track. Other Utah Rural Summit highlights include Lockheed-Martin’s recruitment of rural Utah suppliers, infrastructure investment incentives for rural businesses, updates on the Public Lands Initiative, and a special report on The State of Rural Utah. The annual Utah Rural Summit is hosted by Southern Utah University and Utah Center for Rural Life, and will take place August 4 - 5, 2016. Attendees include government and business leaders from across the state, including legislators, county commissioners, city officials, economic development and planning professionals, and policy makers from both state and federal government offices. The Utah Rural Summit is held in the Hunter Conference Center, located on the campus of Southern Utah University. Registration and additional information about the 2016 Utah Rural Summit can be found at https://utahlinks.org/urs, or by calling 435-586-7707.